Over the last year, our own Junior Girl Tia Shah, has been writing an amazing column about trailblazing girls throughout history. This new Incredible Girls column is in that vein, only this column is about contemporary girls under the age of 25 who are doing awe-inspiring and significant things in the world. Every Friday in 2019, we are going to post a column detailing the life of an Incredible Girl and why you should know about her. Read on for a glimpse into the life of the remarkable surfer and photographer, Shannon Glasson. Living with CAH means she must adhere to an intense daily medication schedule, but she told HuffPost Australia that she has learned to roll with the punches when it comes to her condition, and take each day as it comes. She also said that if she didn’t have her condition, she probably wouldn’t be shooting big waves with no fear, so there is always an upside. 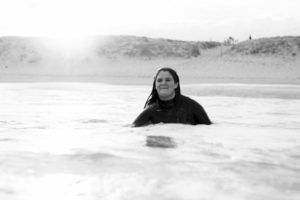 Shannon learned to swim at age two, and walk at age five, so that undoubtedly played a part in her affinity for the ocean, and she said she feels more confident when swimming as opposed to walking. When she was 14, Shannon took her mom’s camera out in the water in Queensland and has been a photographer ever since — she dropped out of school in her late teens to focus on her photography. Shannon said her mom isn’t all that comfortable with her shooting some of the waves that she has shot, but that she just sometimes doesn’t tell her mom just exactly how big a particular wave is, which is probably a solid choice on her part. The biggest wave that she has ever shot has been 15 feet high, which is pretty incredible! Her photography is absolutely stunning, and she has a bunch of locations on her bucket list that she would like to shoot, including Tasmania, Tahiti and Hawaii. Shannon said that she will always be chasing waves. Her story, and her photography, are both pretty incredible, and I am so looking forward to seeing where her career takes her! Definitely am putting some of her gorgeous photography on my wish list for later — it is just stunning, and I can’t wait to see what she shoots next. Here’s to being a little bit more fearless and having the ability to let go in 2019!